State Farm’s decision to withdraw from Florida adds rich context for “the scheme“. Take a look at “the scam” reported in the Miami Herald. As part of State Farm Florida’s plan to stop writing property casualty insurance in the state, the company must move about 161,000 auto insurance policies from an affiliated company that sells homeowners coverage nationwide but not in Florida. The shift is State Farm’s attempt to comply with a state law that prohibits an insurance company or an affiliate from selling auto insurance in Florida if doesn’t offer homeowners coverage here as well. State Farm Fire & Casualty, a national subsidiary of State Farm Mutual, sells auto insurance nationwide and has about 161,000 auto policies in Florida. It also offers homeowners coverage, except in a few coastal states including Florida. Drivers covered by State Farm Fire will be offered policies by State Farm Mutual Insurance, the parent company for both State Farm Fire & Casualty and State Farm Florida. State Farm Mutual doesn’t sell homeowners coverage in any state. That’s right, State Farm Mutual is a shell – pick that one and you’ll find the money that could keep State Farm Florida from going under. 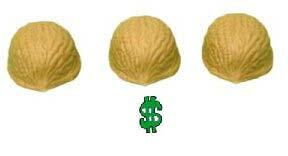 … when a wager for money is made…[a shell game becomes]… a confidence trick used to perpetrate fraud. In confidence trick slang, this famous swindle is referred to as a short-con because it is quick and easy to pull off. Nowdy is of course Daisy Duke. Rick and Johnny are Bo and Luke. Any suggestions for Boss Hogg, Sheriff Coltrane, and Deputies Enos and Cletus? Allstate’s financial shenanigans hit the press: Deferred Tax Assets, That’s Allstate’s Stand…. Allstate, the big insurer, last week declared that despite unprecedented trouble in the markets, it remains financially strong. But tucked deep inside a company report is evidence that Allstate changed its bookkeeping last year in ways that improve its financial appearance. One accounting change added $347 million. Another delivered a year-end boost of $365 million. Allstate’s actions illustrate a broader risk to investors, policyholders and people looking for insurance. Insurers have been asking regulators to let them operate with thinner financial cushions or to pad those cushions with assets they could not otherwise count. For anyone trying to assess the companies’ financial strength, the changes can cloud the picture. That could make it harder for people to make sound decisions when buying policies or annuities to protect their families. Author Posted on February 7, 2009 June 9, 2013 Categories SopTags AIG, Allstate; Willow RE, Book Cooking, Captured Regulators, Crooks in Gucci Suits, Deferred Tax Asset, Economics and Finance, Finance 101, Mississippi Insurance Commissioner Mike Chaney, regulation, Subprime Mortgages, Subprime; Cat Bonds; Toxic Paper9 Comments on Allstate’s financial shenanigans hit the press: Deferred Tax Assets, That’s Allstate’s Stand….